First, one must be able to jump the Esoteric Synapses of the mind. It is not necessary to have a highly developed, trained academic left brain to understand the True Inner World of the Esoteric Wisdom Teachings. A highly developed, trained academic left brain will more often hinder one’s ability to jump the Esoteric Synapses of the mind. 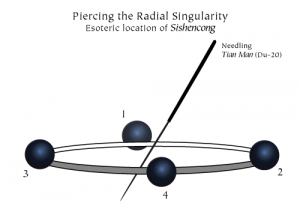 Secondly, the definition of healing has been expanded to encompass the expanded thinking that is necessary to understand the principles and concepts within the scope of Esoteric Acupuncture. The definition of healing in Esoteric Acupuncture states: the desire to move from one level of consciousness to a more desirable level of consciousness. This definition includes all the levels of physical disease/pain/depression/emotional and mental challenges and all syndromes and symptoms included in the disease state. What if an individual has none of those above stated symptoms or syndromes? This new definition of healing is also applicable to those who desire to move into a more refined, higher frequency of the multiple levels of one’s Inner Spiritual Heart and for those who wish to expand one’s consciousness. Two of the methods to expand consciousness is Stillness and to expand one’s vocabulary. Those reading this website are probably more interested in the expansion of the esoteric concepts of the Ageless Wisdom Teachings. Even though there may be newer vocabulary to explain spiritual and metaphysical concepts today, those same concepts and ideas have been here for countless millennia. With the 3 “stars” of the triangle, we are simultaneously moving into infinite spiraling space/time and into The World of Fourness. By the mere fact that the 3 edges (vectors) of the triangle surround a 4th item (space), we now have Fourness. Since waves (space) eventually densifies into particles, we are justified to place a dot in the center of the triangle. If we connect the 3 stars (angles) with the center dot, we now have created the tetrahedron that is the simplest structure in our 3-D consciousness that contains both insidedness and outsidedness and also created Sixness. The tetrahedron is the signature of consciousness. The tetrahedron has 4 sides (also known as 4 events). According to R. Buckminister Fuller, it requires a minimum of 4 events to have consciousness. So the tetrahedron has the minimum esoteric requirements to define consciousness. The tetrahedron has 4 events, 6 vectors (Bresith = “In Beginning Created 6”) and is the simplest structure that contains both Insidedness and Outsidedness. A triangle is the “signature” for tetrahedrons. A tetrahedron has four sides and is the simplest structure in our known universe that has both insidedness and outsidedness. The tetrahedron is the “signature” for consciousness. R. Buckminster Fuller says that if take four events to have thought. But, the 4 also forms the 6. Notice that the tetrahedron has 6 vectors. 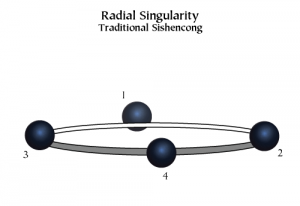 The “Infinite Possibilities of Fourness” starts with knowing the esoteric meaning of Sishencong and the new location of this grouping of four acupuncture sites. 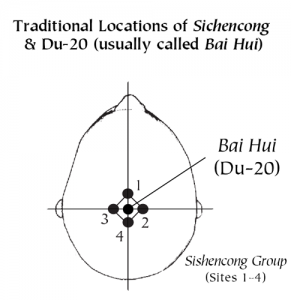 In Esoteric Acupuncture,the Sishencong group (translated as “4 Spirits”) is always associated with the heart system. 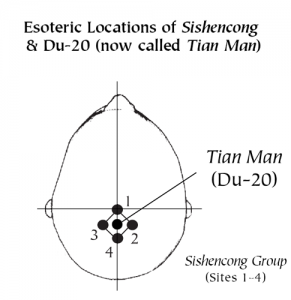 The new location sets up the correct field that may possibly allow kundalini and the finer frequency qi to extend into the extra-cranial Sahasrara/Crown Chakra.